December 27, 1869 in The Truckee Tribune. Alder Creek Meadow area where the Donner Party may have camped. The following article is transcribed from the First Published account of the Donner Party found in The Truckee Tribune newspaper issue dated December 22, 1869, a copy of which can be found in the Joseph Research Library. In 1846 a company of emigrants, among whom was a Mr. Dunbar, with his wife and four children, stopped here to rest after a long and toilsome march. The clouds looked heavy and threatening, and their guide, an old trapper, seeing the danger, urged him forward. Mr. Donner refused to go, having a drove of cattle which needed rest. The main portion of the company decided to proceed, and Mrs. Donner entrusted her children to their care and remained with her husband. A Dutchman also stayed with him. That night the snow storm came on and continued for two or three weeks, abutting [stranding] these three persons in for the winter. Their cattle stampeded, and they were left with but little provision. Early in the spring their friends made their way to the lake, found the hut in which they had sheltered themselves, entered it, and saw a sickening sight. There sat the Dutchman gnawing the flesh from a human arm, which he had roasted in the fire. He stated that Mr. Donner had first died, afterward his wife, and he had been compelled to eat their flesh to keep from starving. From certain evidence, however, they gathered the impression that Mr. Donner had been murdered, his wife violated, and subsequently killed and buried in the snow. Want of reliable evidence prevented the mystery ever being solved. The Dutchman is said to be still living. Mark McLaughlin/ Nevada Appeal News, Service File Photo A glance at Alder Creek Meadow, in the area where the Donner Party may have camped, looking east. The following article is reproduced from the online pages of www.nevadaappeal.com. 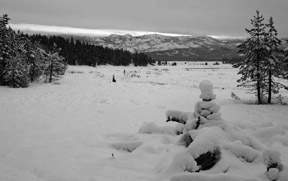 TRUCKEE, Calif. New research suggests members of the infamous Donner Party might not have been cannibals — but some experts are having trouble digesting the idea. Gwen Robbins, an anthropology professor at Appalachian State University in Boone, N.C., recently completed inspection of 85 pieces of bone found in Alder Creek and found all the bones to be from animals — cows, horses, deer and one dog bone. These findings followed a smaller dig in 2004 that also didn’t find any human bones. Robbins and her team operated under the assumption they would need to test 105 samples to make a more conclusive statement about the cannibalism, but because many of the bones were fragmented, burned and otherwise damaged, only 85 were found. The researchers were about 70 percent confident they would find at least one human bone, assuming those human bones were less than 1 percent of the sample and their remains were processed and preserved similarly to other fragments, Robbins said. The human bones would have been on the top of the deposit, Robbins said, but none were found. The findings don’t prove that cannibalism didn’t take place, Robbins said, but they suggest that, at the Alder Creek site, cannibalism may have been limited. The Donner Party was a group of 87 that attempted to emigrate from Springfield, Ill., to California in 1846-47. The group took the Hastings Cutoff through Utah and the Sierra Nevada and was delayed significantly, only reaching California as serious snows came, and only 46 survived what was the harshest winter in the history of the Sierra, according to the website for PBS’s “American Experience” documentary program. Kristin Johnson, the historian for the Donner Party Archeology Project, said though some anthropological evidence might suggest no cannibalism, the historical evidence “is quite clear” that cannibalism took place. “The fact that no evidence was found at Alder Creek doesn’t have any reflection on what happened in the entire Donner Party,” Johnson said. Cannibalism took place at four different sites with different groups from the original party, Johnson said, and Alder Creek was a site that saw cannibalism for a short period. The bones found, she said, were boiled and changed into tiny, rocklike bits. Johnson said the human bones would have decomposed, meaning that the physical evidence might not remain. “The bones that would bear the marks of butchering didn’t survive,” she said. Rescuers of the Donner Party reported cannibalism, Johnson said, and survivors from the Alder Creek campsite testified that they ate human flesh — a bold statement to make. Though the study is not conclusive, Robbins said its findings could indicate something about morality if true. “It would certainly say something about the power of culture to determine what’s food, even in the worst of conditions,” she said.